Submitted by witness on Tuesday, February 14, 2017. LOCATION DETAILS: Vaughn Woods State Park in South Berwick, Maine. OBSERVED: I was hiking in the woods, doing occasional whoops and wood knocks to try to illicit a response. It felt so squatchy from the moment I got there, but I got no response to anything. I was about an hour into my trek and I see off the beaten path a series of footprints. The snow had stopped yesterday and I tell you these prints were FRESH. I am thinking I just missed that squatch by a matter of minutes or hours! SO CLOSE! Well, let me tell you what!! These things were 12'' long and the stride between steps was measured at 8 feet! The line of prints was straight, just like you see with other evidence of a bigfoot trail! It was INSANE. There were no other prints around, I followed these about a quarter mile into the depths of the woods and off the beaten path. The snow was up past my knees at some points but how could I stop following this epic trail! I could see some prints more clearly than others, I could see toe outlines and the heel in a few! I have pictures and videos to share with you. By the looks of the size of the prints and the distance in stride, this seems like an adult sasquatch, These things were huge!! The sun was setting and my phone was dying so to my dismay I had to turn around and get back to the path before dark, otherwise I would have followed those tracks until they lead me to whatever made them, and we know what made those beasts! This is the BEST day ever. My very first bigfoot evidence and experience and I couldn't be happier!!! There is literally NOTHING else this could be, it is an amazing and documented bigfoot footprint trail! ALSO NOTICED: This happened just today, February 14th, 2017. I documented the footprint trail with pictures and video. I have everything, would love to send them to you! TIME AND CONDITIONS: 4:30pm-sun was setting and light was bouncing through trees. Snow was everywhere, quite a winter wonderland. ENVIRONMENT: Vaughn Woods State Park in South Berwick, Maine. The trails were in an area right along the Piscataqua River. I had gone away from the river and up into the woods further before I saw the prints. The snow was fresh from yesterday and the it took a lot to trudge through. I had the opportunity to correspond with the excited hiker two days after she submitted her report. We agreed that she would send me her pictures and video and then we would discuss her findings. True to her word she sent 5 images and 3 short video clips showing the trackway she had found. Not having any type of measuring device, I asked her how she came to a determination of the size of the tracks and stride observed. 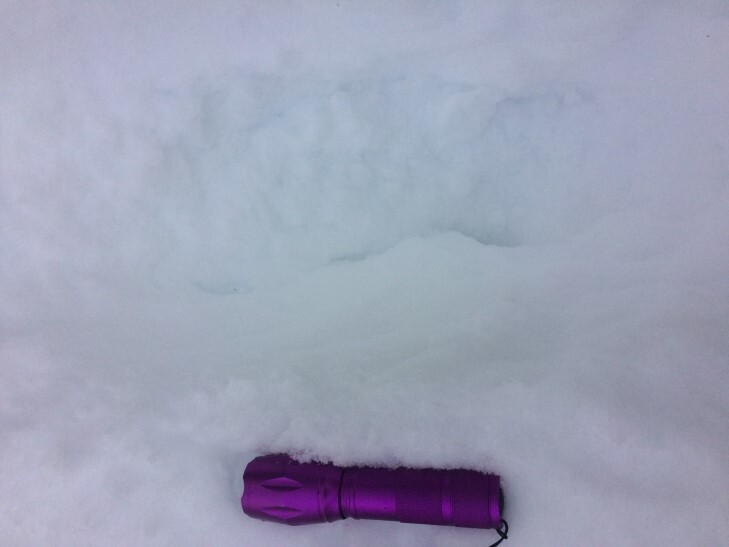 She used a small flashlight to determine scale (seen in one picture) and she used her stride to approximately measure the stride of the track way. She had been hiking in Vaughn Woods Memorial State Park which is a 160-acre state park in Southwestern Maine. There is only about 3 miles of trails here that wind through a mixed growth forest along the Salmon Falls River. To the west (approximately 4 miles) is the city of Dover NH. To the east there is much more rural undeveloped land including water sources and forests. I did an independent site visit without the hiker 4 days after her finding. Unfortunately, between the time when the hiker found her track way and the time I was able to visit, another winter storm had blanketed the region with 18-24” of snow. The area is a popular hiking/snowshoeing destination with the local populace. Thankfully people had been snowshoeing and had packed the trails down making it easier to hike. While there I did notice bounding tracks of deer as well as coyote. Other animals native to the region include rabbit, squirrel, fox, porcupine and moose. Footprint pictures historically never do the find justice. My initial thought was that maybe the hiker had seen the bounding tracks of a fisher cat or a marten. I found an unusual track way coming down a ridge towards the river. The prints were 15” long, 7” wide at the toe, and 6” wide at the heel. I measured 53” from heel to toe and 68” from toe to toe. The prints were not staggered and were in a relatively straight line one behind the other. I could not discern any toe or heel marks as the prints had been filled in by the recent storm. 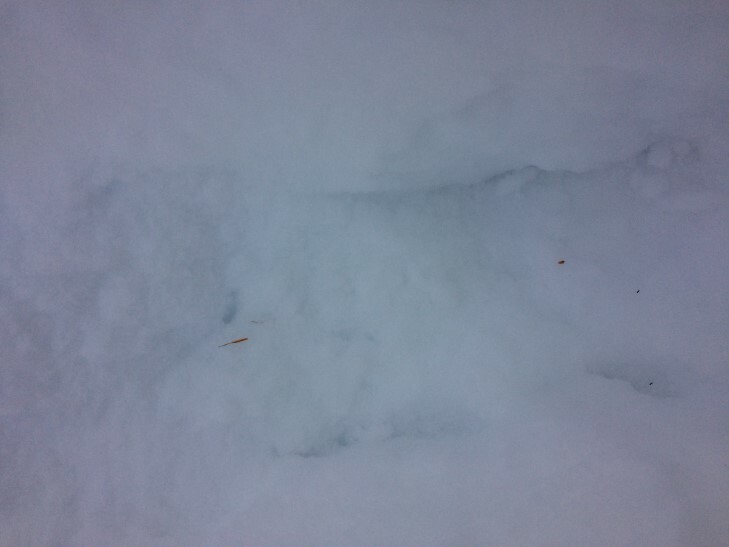 After my visit, I talked to the hiker and she told me the tracks she found were approximately 1 ½ ’- 2’ deep into the snow and were on a different trail than the one I was on where I had seen tracks. 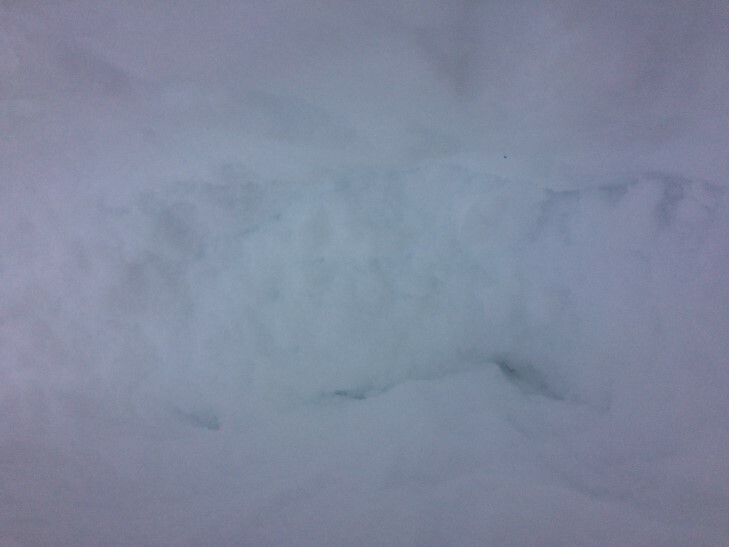 She could see toes prints (digging into the snow) and heel strikes in several of the prints while following the track way. She told me her fascination with Bigfoot began in college one day when she came across the show “Finding Bigfoot”. After watching it she became interested in the phenomenon. She is incredibly excited as this is her first experience with what she feels is physical proof of Bigfoot existence. The hiker is a nurse at a local regional hospital. I found her to be honest, sincere and a credible witness.